Includes Slow Movement, Sufi Mudra & Deep State Motion, Hip Motion Techniques, Sensory Exploration with optional narration track. New! Includes Slow Movement, Sufi Mudra & Deep State Motion, Hip Motion Techniques, Sensory Exploration with optional narration track. Bellydance’s beautiful, curvilinear movements are a natural path to inner connection. They massage your internal organs, awaken pelvic energy, release low-back restrictions, expand spinal mobility, and increase graceful strength without joint stress. 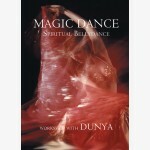 Practice along with Master Teacher, Dunya, as your body becomes recharged, vital, flowing and sensuous. True to Eastern tradition of meditative, organic teaching, Dunya’s focused presence and gentle expert guidance create an inspiring environment for discovering new avenues to your essence. Moving from her peaceful center she invites you to move from yours. Good for all levels. Attentive motion is the key to releasing tension. An oceanic oscillation of gentle stretching born on breath quiets the mind and awakens sensation. Sufi movement meditation practices allow cells to absorb and heal. Subtle, awakening processes promote fluid, accurate hip movement and lower spine mobility. With these awareness exercises, release undue tension and increase sensuousness as your body grows stable, integrated, strong and sensate. NEW FEATURE! Turn on an instructional Narration to hear fully articulated breathing, alignment, visualization, movement initiation, and emphasis cues for technical accuracy and inspiration. Turn off the Narration to follow visual and musical cues when you prefer a more meditative, nonverbal experience. Thank you! Your purchase of items and events through the Shop is tax-deductible. Your payment benefits Dervish Society of America, a nonprofit 501-C3 tax-exempt organization supporting the activities of Dancemeditation™.